So you now have the sad backstory- lets get on with what DID work. The photo that rocked my world. Ugh. I can’t believe I am showing you this. The Video that Changed My Relationship with Food Forever. So that lecture got me started. Not all food is the same. Wow. How many times I had complained to my girlfriends that I was eating less than 1500 calories a day, and doing cardio like a crazy person, but getting nowhere? Something just had to be wrong with my metabolism (I even had my thyroid checked). After watching that video I learned that my metabolism was just fine- but it was ME working against it. I especially identified with the part about the insulin response to carbs. That part had me jumping up and down in my seat- he was talking about me! So I learned that I was just a passenger on the Carb/Craving/non-weight-loss roller coaster… It was not a lack of self control (like I would tell myself when I was pinching my fat in the mirror), it was a cause and affect relationship between what I put in my mouth and how my body’s hormones reacted to it. My insulin was doing a real good job of turning every carb I ate into fat, and causing cravings for even more. Nope, all calories are not created equal. 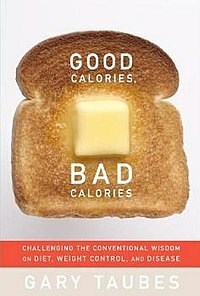 I then read Good Calories, Bad Calories by Gary Taubes. I will say that the book is exhausting to read- lots and lots of science and big SAT words. His major point is that we don’t get fat because we eat too much, and exercise too little. We get fat because we eat too much of the wrong things… Here is a video of him giving a interview over his position about why we get fat and what we can do about it: Why we get fat, and what we can do about it. So not only did I need to cut the carbs (including starches, sugar, beans, etc), but I needed to add FAT to my diet. SHUT THE FRONT DOOR. Add fat? I had been eating as much fat free as possible in all my diets before (you know- the ones that didn’t work). And on top of that – what about high cholesterol? My husband was being treated for extremely high cholesterol (400+ TC) for years. Isn’t this just a recipe for a heart attack? Without going into all of the research I did on that- and believe me, I did tons (because of the assumed risk I thought it may be to my husband)… I will just give you the results. My husbands Total Cholesterol was over 400 May of 2011- while ON his cholesterol lowering medication. His Total Cholesterol after 5 months of Paleo- eating tons of fat was 187 without the meds too! Yes, you read that right. He dropped his cholesterol by over half and was instantly taken off of all of his medications. *Disclamer: We are not talking about deep fried fats, people. Good healthy saturated animal and plant fats. Cooking steaks in butter? Oh yes we did, and still do. You should too- it’s really tasty. 🙂 You are now scrolling back up for those links aren’t ya? It’s okay, I will wait. They gotta replace the fat with something… and it ain’t pretty. So, I had to completely unlearn calorie counting and food-guilt. Weight loss is NOT just a simple equation of Calories In Versus Calories Out- it’s just not that simple AT ALL. I also had to completely forget everything I had been doing forever in relation to fat intake. Fat is your friend. I could wax on forever about why- but go back and watch those two videos. Check out Dr. Eenfeldt’s YouTube channel for even more information and detail. Gary Taubes has another book aptly named Why We Get Fat And What We Can Do About It. It’s like the Cliff’s Notes for the Good Calories, Bad Calories book. So this covers (the highlights anyway)- my re-education about Food. I will say that your diet is 90% of your weight loss capability. You can’t undo bad food choices with crazy insane workouts (I have a decade to fatness to prove that under my belt). You have to feed yourself well- then work out in a way that will put that food to good use… then the changes will come- and quick! To bring the timeline from my last post up to date… I started at 218… lost 20 just low-carbing by January 2012. I went full throttle on Paleo in January- and by March I had lost another 25. I was weighing in around 180 pounds or so in March 2012… and looking for a plan of attack for my exercise, to keep the ball rolling.